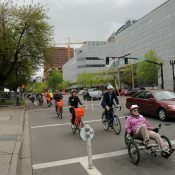 At a public hearing on Tuesday, Sherwood police and city councilors clarified the purpose of a proposed city ordinance that prohibited the use of bicycles and other “wheeled activities” within 30 feet of a public space. According to officials, the ordinance is not aimed directly at bicycles nor will it apply to all areas of the town. Due to weather conditions, Sherwood Police Chief Jeff Groth (who has been the driving force behind the ordinance) was unable to attend the public hearing. Captain Jim Reed spoke on his behalf and was quick to point out that the ordinance will only apply in areas where the City Manager approves signage prohibiting certain activities. 2. Riding or using a bicycle, unicycle, roller-skates, roller-blades, scooter or skateboard in any public place, park or greenway that is specifically designed for such use, such as roads and public right of way. The Mayor’s amendment and Captain Reed’s words at the meeting seem to indicate Sherwood has no problem with people continuing to use bicycles in public spaces, so long as they obey posted signs. 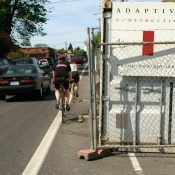 — Follow all our Washington County bike news here. Contact Will Vanlue, will [at] bikeportland [dot] org with tips and feedback. Sherwood officials quoted in the story seem very interested in not being unreasonable about limiting vehicles specified in the code. Question is whether the law the city is adopting will be effective in deterring the damage the city has had. Make the sidewalks out of that soft squishy silicone gel wrist support material often seen in front of office keyboards. Try going too fast on that! I don’t like to just stand around and throws stones at suggestions to combat an alleged nuisance. but…. In Portland you can ride through parks and it is (generally) not a problem, there are places where parks cover many city blocks so that they are bounded on all sides by busy/fast streets and the best and safest way to an appropriate crossing is to use the path through the park. What happens when someone takes up the cause of streets not being specifically designed for bicycle use? I imagine that Sherwood must have its own Rock Creek or Corbett style grumpies. Btw. Sherwood, It’s all well and good to tell the groms they can’t be terrorizing the pensioners who feed the pigeons, but if this is an issue it’s clearly time to get moving again on your skatepark. Sherwood, as well as other cities and neighborhoods face a mindset held by some of the people within skating and bmx-freestyle biking culture that regard almost any element of the urban infrastructure to be up for grabs, to put into use as apparatus for riding and skating opportunities. 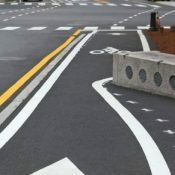 The most successful strategy for reducing damage to public and private property from freestyle skating and biking is probably one that can come up with some compelling substitutes for the urban skate-bike landscape. 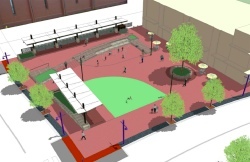 Skate parks supply what some people require for freestyle biking and skating, but maybe cities could be taking a closer look at developing some additional options that aren’t all confined to skate parks. I think that the misuse of the yet-to-be opened facility is what is causing concern. Despite currently being surrounded by a chain link fence, kids have already jumped the fence to skate the structures.